Posted: Sun Aug 28, 2016 1:11 pm Post subject: Perfect Dark Model Remakes. 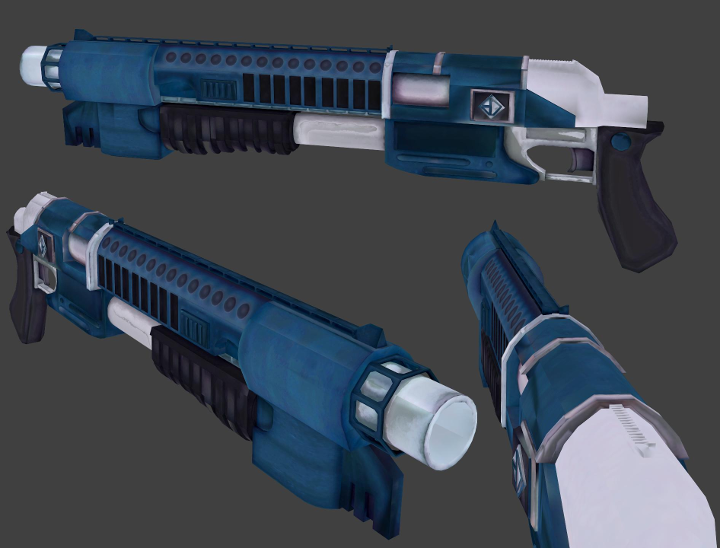 Like with the GoldenEye models, I decided to do Perfect Dark, due to PD's weapons being more fictional, I can be more open to interpretation, rather than using the models from GE, which are mostly based off real-world weapons. 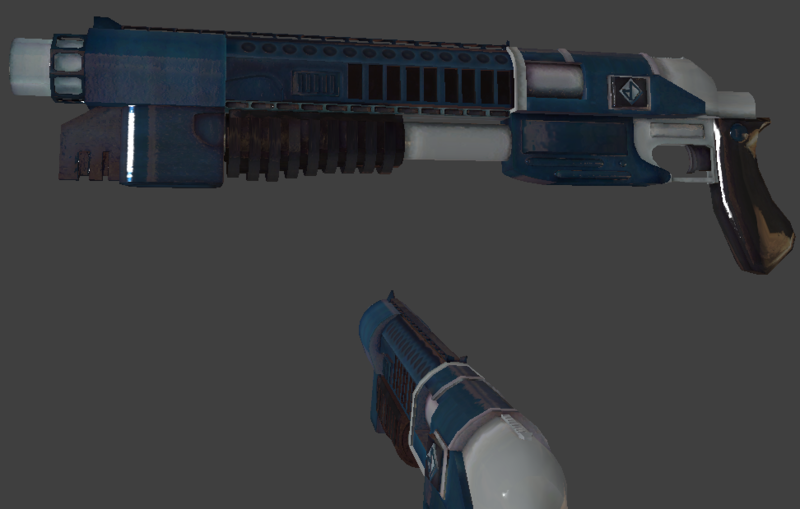 Here's my rough, test model, the Shotgun, some changes have been made to make it seem less awkward. Due to a large picture, I have a smaller version here, URL below is for a larger render. Man I'd pay to have an irl model of that sitting in my room. Thanks, but too bad the only way is if you have a large 3D printer. Anyhow, the model has been ported to Source! So now I can use normal and phong maps to give it a shinier feel. Might test it out as a model replacement in GE:Source. Since the Model Viewer with the Source SDK isn't the best. Some minor texture issues such as bad texture seams have been removed, as some shading has been added to the cream spot near the handle. Or I could animate it and port it to something else, depends on how much work I want to put into it. Pretty slick work. Belongs in a PD: Source mod, for sure. Perfect Dark Source was a thing, but it didn't really kick off. Simply because there wasn't really enough content to start off with. It also never really updated. As a result, it used a dated version of Source that pretty much became outdated. Ok - I love how that's designed! It looks like the kind of firearm you'd pickup and say "this is a good one!" AND it looks AWESOME! 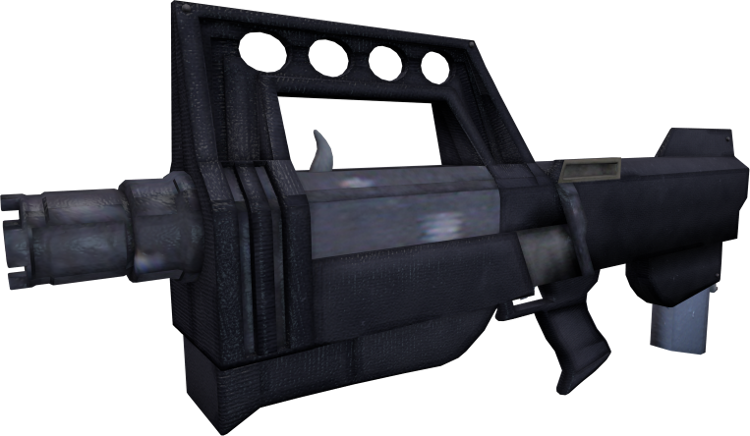 Thanks, might try to animate it and make a lower detail model, soon. 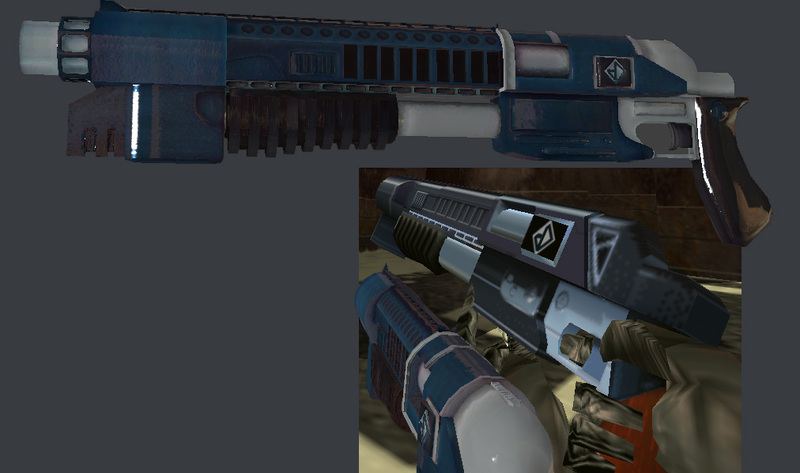 I got it working as a skin for the Shotgun on GE:Source. Sorry for the low detail graphics/screenshot size, running it on a laptop. Model also looks oddly placed since I rigged it a tad too high. It's pretty good, I like it more compared to the XBLA model. If I had to give a few tips I'd say try to make the cream spot near the handle flat instead of curved like a pipe. The colors are a bit off as well, the blue color is too strong and the chrome parts are too white. Looking forward to seeing it animated, great job. I made that area around there cream, I also made the handle plastic, since both stood out a bit better, or looks more consistent. I'll fix the hue issues. I also noticed a triangle-like detail I forgot on that section, now. Will be added. Idle animation, hand models are from PD:Source, since they fit pretty well. Sorry for the small size, the Source model viewer fits to screen without the ability to change the display res, half the screen is also cut for viewing model settings, too. And I said earlier, on a laptop. The looping isn't right since I didn't know where the animation started or ended when I had to cut the play and pause from the looping. Dunno why I put the little hop, but I thought it would look pretty cool. Will look horrible and jarring when switching to animations. I might just remove it if needed for other animations to look right. Finalized animations. Found out source has the ability to do smooth transitions between animations. So even the little hop on the idle animation won't do much to make it jerky. 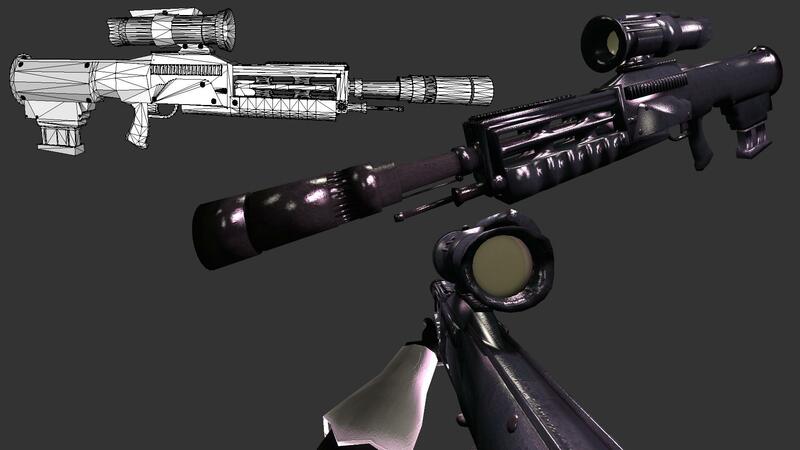 Sniper model revamp. This took quite awhile to make, as it was a rather complex model. Trying out animation, came out pretty bad.